When I was on Salts Spring Isle many years ago and had little experience with plant medicine, I decided to go walking in the local forest. I took my shoes off and went barefoot feeling the ground under my feet. I walked for about and hour when I felt something stinging my ankles. I thought it was a bee sting, maybe I stumbled upon a wasps nest. I found a log close by and jumped up on it. I looked at my ankles to see if there where marks, nothing. I looked around to see if I could spot a bee or two, nothing. I was confused but young and brave/stupid so I jumped off the log tot he ground and felt the same stinging again. I jumped back on the log and realized it was not bees but a plant that was stinging me. I was surrounded by it. It was a dark green plant, sharp edges on it leaves. Looked like a cross between a pot plant and a mint plant. I later found out it was Stinging Nettles. One of the greatest plant medicines on the planet. A tonic that demands attention. A great healer. Nettles are rich in calcium (so much more then milk, milk is not a source of calcium for humans it is a source for disease, more on that later). Rich in Iron, minerals, anti inflammatory properties. It is abundant, hearty and tasty. The acid which burns the skin has no long lasting effect. Its burn helps with arthritis or numbness. It takes 2 seconds in hot water to neutralize the nettles burn. You can eat it as a green, use it in soup, make a tea from it, dry it, love it. 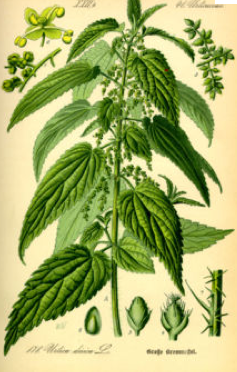 If you ahve not discovered the wonders of nettles, then do. It gives life, it give strength, it gives support, it wakes you up, it wakes your system up. It is a great friend and I hope you find it as helpful as I do.